The Second Strategic Highway Research Program (SHRP 2) has identified various NDE techniques for condition survey for of bridge decks. The report ranks these methods based on their effectiveness in detection and characterization of four major deterioration types: delamination, concrete degradation, reinforcement corrosion, and vertical cracking. SHRP 2 recommends the use of ground penetrating radar (GPR), impact echo (IE), ultrasonic surface waves (USW), half-cell potential (HCP), electrical resistivity (ER), and chain drag/hammer sounding for bridge deck evaluation. In Impact-Echo test, a stress pulse is generated at the surface of the element. The pulse spreads into the test object and is reflected by cracks, flaws or interfaces, and boundaries. The surface response caused by the arrival of reflected waves, is monitored using a high precision receiving transducer (Malhotra and Carino, 2004). When stress waves travel within the concrete element, a part of emitted acoustic waves by the stress pulse on the surface is reflected over the boundary layers, where different the material stiffness changes. The data received by the transducer is normally analyzed in the frequency domain to measure the wave speed and the thickness. This procedure has been standardized as the ASTM C1383, “Standard Test Method for Measuring the P-Wave Speed and the Thickness of Concrete Plates Using the Impact-Echo Method”. The use of Impact-Echo method for detection of delamination in concrete decks with asphalt overlays is somewhat limited to low temperatures. The detection of the boundaries of delaminated area requires using a very dense test grid. The Ultrasonic Pulse-Echo (UPE) method is used for thickness measurements, flaw detection, detecting delamination, and evaluation the integrity of concrete. The concept behind this method relies on the propagation of stress waves through materials. A transmitter introduces a stress pulse into the object at an accessible surface. The pulse propagates into the test object and is reflected by flaws or interfaces. The emitted impulse and the reflected acoustic waves are monitored at the receiving transducer. The signals are analyzed in the time domain, to calculate the wave travel time. If the wave speed in the material is known, this travel time can be used to evaluate the thickness of medium. Depending on the multi-layer system under investigation, the travel time of shear or compressive waves are used to evaluate the thickness of each layer. The application of UPE method for bridge deck scanning can be time consuming, since a proper scan requires very close spacing between the test locations. The application of the method is somewhat difficult over rough surfaces. Ultrasonic Pulse Velocity (UPV) is an effective non-destructive testing (NDT) method for quality control of concrete materials, and detecting damages in structural components. The UPV methods have traditionally been used for the quality control of materials, mostly homogeneous materials such as metals and welded connections. With the recent advancement in transducer technology, the test has been widely accepted in testing concrete materials. Ultrasonic testing of concrete is an effective way for quality assessment and uniformity, and crack depth estimation. The test procedure has been standardized as “Standard Test Method for Pulse Velocity through Concrete” (ASTM C 597, 2016). Condition Survey using Ultrasonic Pulse Velocity can be use to evaluate the quality of concrete quality (learn more), evaluate Homogeneity and Uniformity of Concrete, Measurement of Surface Crack Depth (read more), and prediction of Compressive Strength of Concrete (read more). Ground penetrating radar (GPR) is a very useful technique for nondestructive evaluation of concrete. GPR uses pulsed electromagnetic radiation to scan concrete. It can be used to locate rebar, voids, and delamination in the depth of concrete deck. 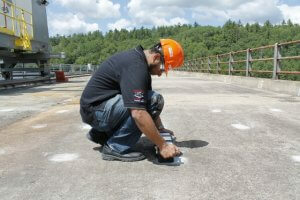 When it comes to testing the bridge decks, GPR has a great advantage as it can detect defects from the asphalt overlay. Sneed et al. reported that “GPR can be used to evaluate the condition of a concrete bridge deck with or without an asphalt or concrete overlay. 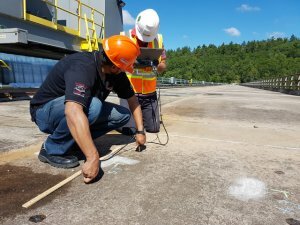 GPR is currently the only non-destructive method that can be used to evaluate a concrete bridge deck with an asphalt overlay. The practice has been standardized by ASTM D6087, 2008. GPR consists of a transmitter antenna and a receiver antenna, and a signal processing unit. GPR emits electromagnetic pulses (radar pulses) with specific central frequency to scan the subsurface medium. The reflected waves from subsurface layers, and objects are captured by the receiver antenna. The scanning apparatus can be mounted on a truck or a special vehicle and perform the scan at the traffic speed. This will eliminate the need for extended road closures. The main advantage of GPR method is the speed of test. Large areas can be scanned in a limited period. The scanning antenna can be installed on a moving vehicle, and can scan the bridge deck at highway speed. Application of GPR in concrete bridge deck evaluation can be as simple as locating the reinforcement, or thickness of concrete cover. It can also be used to identify potentially delaminated areas. GPR can not directly detect delaminated areas on the concrete deck. Delaminated areas can only be detected if there is enough moisture in them. GPR can not provide useful information about the mechanical properties of concrete, nor corrosion of steel reinforcement. Sign up to our Newsletter and receive the latest blog posts from our knowledge centre, and updates on our novel technologies. This entry was posted in Bridge, Concrete Deterioration, GPR, Inspection and Evaluation, NDT, Ultrasonic Testing. Bookmark the permalink.